The South Korean company, LG Electronics is set to unveil its new flagship smartphone — the LG G6 — at a pre-event on February 26 ahead of Mobile World Congress 2017 in Barcelona, Spain according to industry sources on Monday. The LG Electronics after a ‘save the date’ confirmation for the event has now started sending official media invitations for the February 26 event. 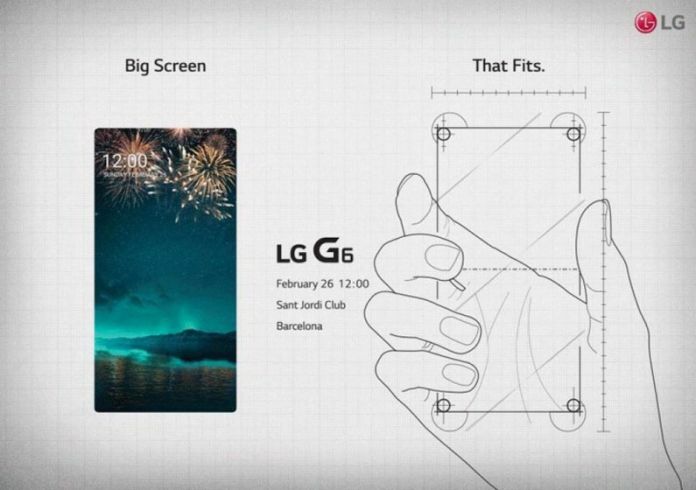 LG’s official invite, shared by CNET, shows “Big Screen. That Fits” tagline with two images. One of the images shows a large screen with no bezels while another image shows how easily the device will fit into the hands. The new teaser image seemingly confirms that the LG G6 may sport a bezel-less design at the front. Earlier leaks have pointed that the LG G6 will feature a 5.7-inch – which was shown off by LG Display last month. One of the biggest highlights of the design is said to be the sleek bezels and the upcoming flagship is expected to feature screen-to-bezel ratio of over 90 percent. LG’s forthcoming handset is due to launch at US carriers on April 7, nearly a month after it goes on sale beginning March 9 in South Korea, according to well-regarded tipster Evan Blass of VentureBeat. The possible LG G6 release dates come courtesy of planning material reviewed by Blass. Unfortunately, no details on the LG G6’s the UK or Australian release was part of the report, however, it’s likely the handset will launch in those regions on or close to the US launch date. Some of the highlights of the LG G6 are said to be the first non-Pixel smartphone to come preloaded with Google Assistant out-of-the-box, dual rear camera technology, no longer feature a removable battery, waterproofing capability with IP68 certification, and featuring latest Qualcomm Snapdragon 835 processor.